Sarah Huckabee Sanders: The Idea That Trump Would Encourage Violence At His Rallies Is "Absolutely Absurd" - Joe.My.God. 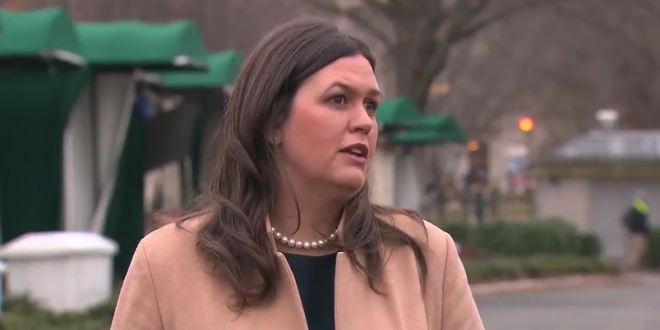 In an interview on Wednesday with Fox & Friends, Sanders was asked to elaborate on the White House statement saying Trump condemns the attack on a journalist that was carried out by one of his supporters during his rally this week in El Paso. BBC cameraman Ron Skeans was shoved to the ground by a Trump supporter while the president railed against the media. “The idea that the president or anybody on his team or in his administration would encourage violence is absolutely absurd,” Sanders said. As you undoubtedly know, the president has openly incited violence against protesters at his rallies on many occasions. Hit the link above for just a dozen such examples.